All marketing teams have one or two main tools they use for research. 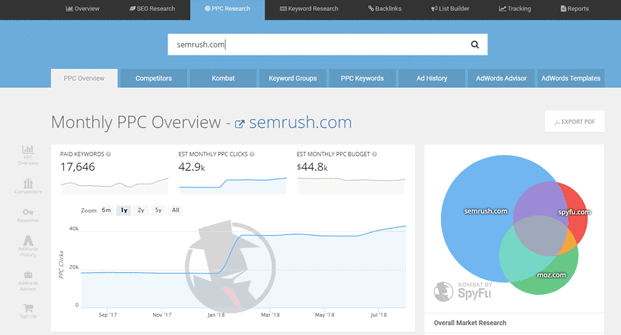 SpyFu and SEMrush are 2 of the more popular choices. The core focus of both products is competitor research for SEO and PPC. In short: seeing who is ranking well organically, and who is advertising profitably. They show you backlinks, ad copy, rankings, and much more. I’ve compared the tools against each other to help you figure out if either of them fits your needs. Note that SEMrush has transformed into more of an “all-in-one” marketing tool. I’ll touch on some of these extra features briefly, but the review will mostly focus on competitor research. Both SpyFu and SEMrush have 3 main plans. One nice aspect is that you get most of the features on all the plans. The main things that change as you spend more are higher limits and a few advanced features that are only needed for marketing teams. If you’re just an individual, the base plan (or one step up) for each tool will likely have everything you need. 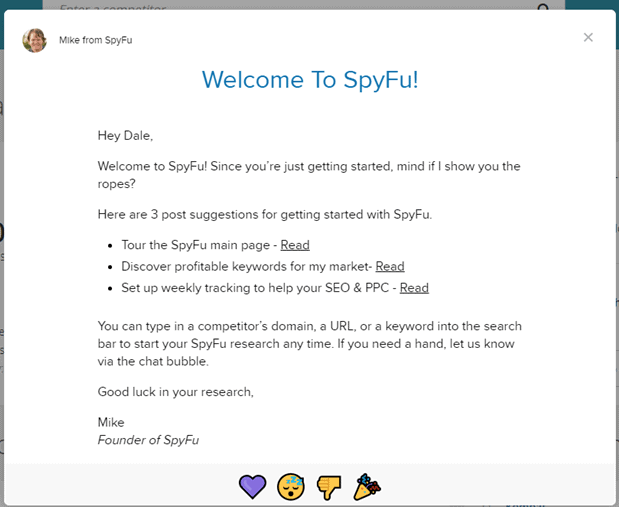 If you’re just looking for the cheapest competitor research tool, go with SpyFu’s basic plan, it’s as cheap as you’ll find anywhere. But in most cases, you need to weigh the quality of features against the costs, so read on. SEMrush has 3 main plans, but also offer a completely custom plan for enterprise customers. Note the ability to add a limited number of users to each plan at an extra monthly cost. SEMrush isn’t known for being the cheapest, but do have a good reputation for quality. Also, with the amount of features and tools they offer, you may be able to use SEMrush to replace other smaller tools that you currently use. SpyFu and SEMrush both can do a lot. It’s easy to get overwhelmed by all the functionality when you first login. That’s why I’m starting with ease of use. The more intuitive tools like these are, the less time you’ll waste trying to figure out how to do what you want. There’s 2 parts I always look for when I use a new tool: what onboarding process is available to guide me, and how intuitive is the dashboard. Other than that, you’re left alone, so I do think the onboarding process could be improved. However, I’m impressed by how intuitive the dashboard it. All the main functionality is divided into clear categories on the dark top menu bar. Furthermore, each of those categories has a similar layout. Most have the same input or search bar at the top where you’ll enter in a keyword or domain. Even without guidance, it’s easy to use. SEMrush doesn’t have much of an onboarding process. If you really need help, you can sign up for a live demo. It’s a little bit hidden at the bottom of the menu bar. But aside from that, the backend is really well designed. The search bar over the main panel of your screen will also always be there, and the structure is fairly consistent across the different smaller tools in SEMrush. Overall, both tools don’t have the best onboarding process, but have great layouts that are intuitive for new users. Each of these tools allow you to enter in a domain and see how its organic or paid traffic. Let’s start with the SEO side. 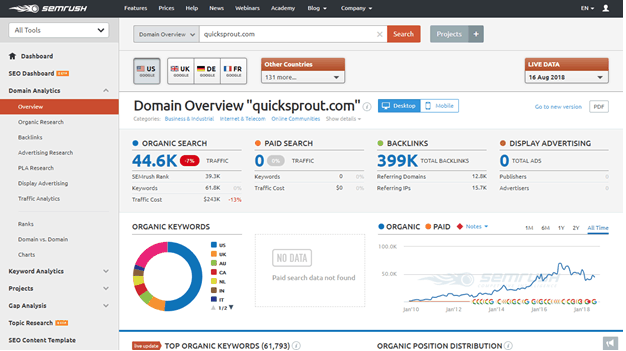 This overview gives you highlights of organic traffic, keywords, and click value. It also shows you how many keywords fall into different buckets (e.g. page 1 keywords, “almost there” (second-page keywords). This overview doesn’t have extensive detail, which is why there are 7 other “tabs” below the search bar at the top of the screen. I’m not going to go over every one, but will go over a few of the ones that are usually the most important. This is probably the only strangely named part of SpyFu, so I’ll give it a pass. Kombat here is meant to signify that you’re pitting multiple sites against each other. The keywords that all 3 sites rank for. The keywords the 2 competing sites rank for that yours doesn’t. Keywords that you rank for that competitors don’t. This can help you find new keywords to target, or see where you face the most competition and may want to shore up your rankings. The “SEO Keywords” tab will let you dig in deeper to the keywords that the site you entered ranks for. This is a good time to note that SpyFu only has data for the U.S. and U.K., with U.S. chosen as default. You switch between the 2 using the very top menu. If you target any locale, this could be a deal breaker, and SEMrush will serve you better. We’ll just look at the SEO parts here. You can choose from data for over 130 countries just under the search bar, which is where you’ll enter a URL that you’re interested in. Similarly to SpyFu, entering a domain and searching will bring up an overview. It contains basic organic search traffic levels and keywords, along with backlink data. It also has advertising data. We’ll just look at one of these here: competitor analysis. The competition level metric will give you an idea of how closely similar sites cover topics that you do. You can also click any of the links under “common keywords” to see which keywords both sites rank for. 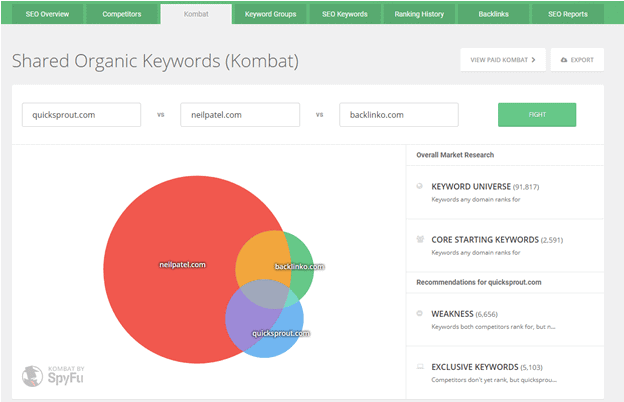 Same goes for “SE keywords” to see all of of the keywords the site you entered ranks for. This is another SEO feature that isn’t included in “domain analysis”. Instead, it has its own menu option lower down. You can enter up to 5 sites, and pick to look at organic or paid data. Gap analysis shows you keywords that the sites share with each other. It’s very similar to SpyFu’s “Kombat” tool. You can sort by the keyword rankings of any of the sites you enter in, along with search volume, keyword difficulty, volume, and CPC. Since there’s overlap between SEO and paid advertising, there’s a lot of overlap with the data that we just looked at in the SEO section. Regardless, both tools offer specific data and feature for advertising research, and it’s arguably the most important part of each platform. 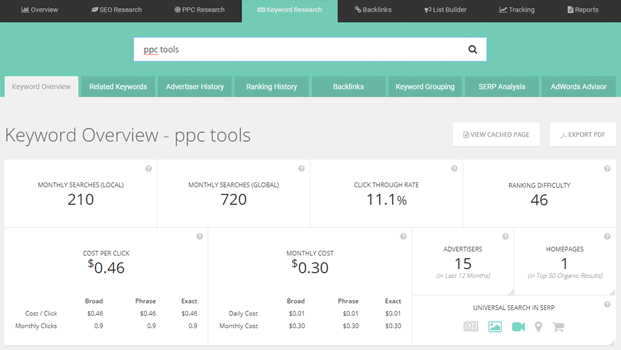 All the advertising data in SpyFu is found under the “PPC Research” tab along the main menu. 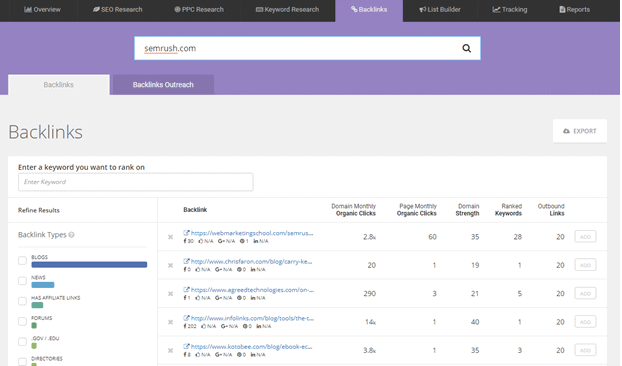 If you can figure out how to use the SEO research tab, this will be intuitive, since it’s almost the same layout. 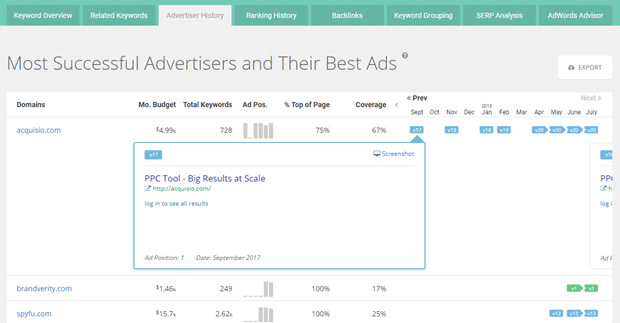 The overview will show you the amount of keywords that a site has bit on, along with their average monthly budget, and main competition. Again, let’s just look at the 2 most useful ones for most users in more detail. The ad timeline quickly lets you see where they are focusing their current attention. Clicking one of the small markers in the timeline beside a keyword will expand a section that shows you a preview of the ad copy that was run. The color coding tells you how often the ad copy was changed. This is often the only feature that solo marketers care about, and SpyFu does it really well. If you find yourself in that situation, going for the cheapest plan is likely your best choice. The advertising data in SEMrush is split up into 2 parts: by domain and by keyword. Here, we’re going to look at the information you get by searching for a domain, similar to SpyFu. All the same data as SpyFu is available, like trends (how frequent they bid on a keyword), cost, and traffic. Two of these let you view historical ad copy used, and set SEMrush apart from SpyFu in this regard. Click on a month and a section will expand showing you the ads that were run. Often, you’ll want to target multiple keywords with a single ad, so viewing ad copy based on single keywords isn’t too useful. You can expand each ad to see a list of all the keywords that were targeted when this ad ran. While both tools have great advertising data, SEMrush makes that data more useful when put head to head. 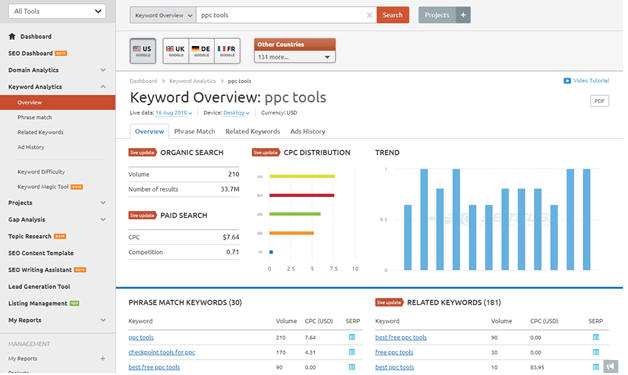 Another main purpose to buy either of these tools is for keyword research. Let’s look at what they have to offer. The third major tab on the top SpyFu menu is for keyword research. 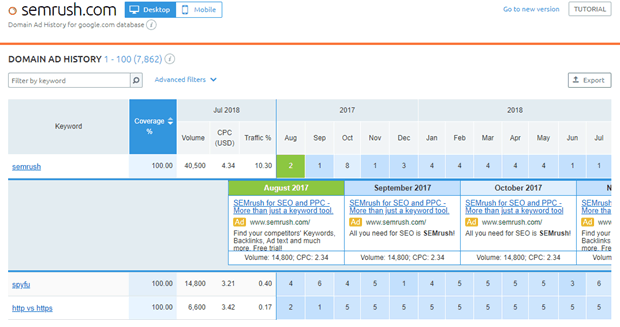 Type in a keyword into the search bar and you’ll get an overview that tells you the monthly search traffic, ranking difficulty, and a few advertising-related stats. Most of the information is geared towards PPC, but backlink data and ranking difficulty is still useful for SEO purposes. 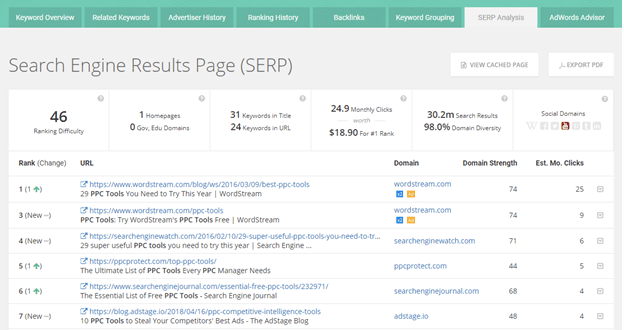 It tells you about any recent rank changes, as well as the domain strength of each page. Pretty basic, but a good high level way to assess competition levels. It has the same layout to the ad history feature of the PPC feature we looked at before. If there are past versions of the ads, you can view them to see what changed. Very useful to learn from the time, money, and effort of others. 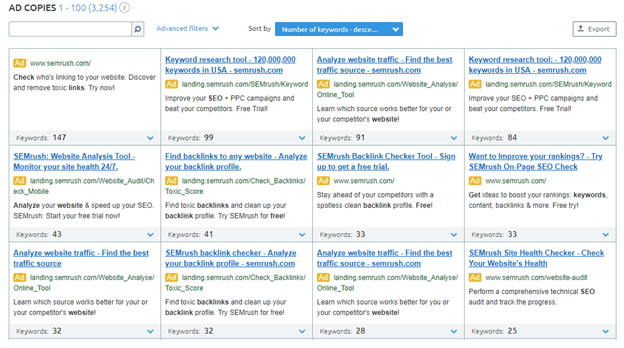 SEMrush has a separate section for keyword research under “Keyword Analytics”. 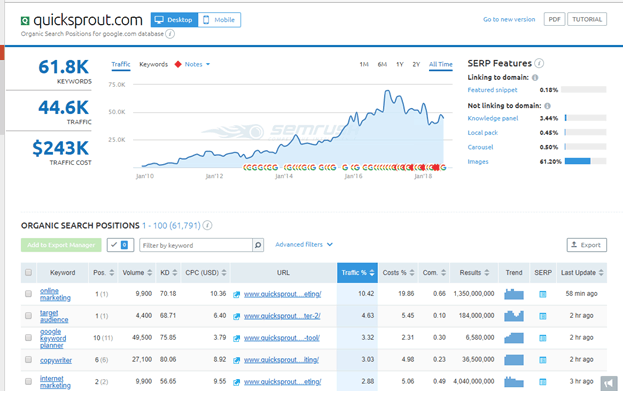 Both SEMrush and SpyFU have similar traffic data for most keywords. There are a few other keyword research features that pop up here in the menu. There are 2 different ways to see keyword difficulty. It gives you a difficulty percent for the keyword, and also tells you if there are any special search result features. 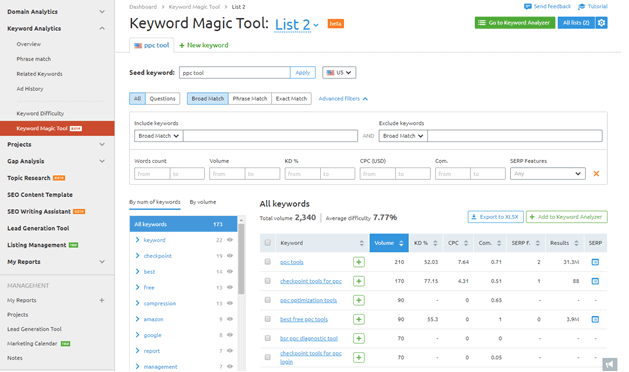 Alternatively, you can use the “keyword magic tool,” which is in beta as of writing this post. It’s good, but nothing too special. The big issue currently is that many of the keywords don’t have a keyword difficulty percent, so the average score is skewed and useless. As a note, the difficulty percentage is generally accurate, so you can use it for a quick idea of how tough a keyword is to rank for. Both tools are great for keyword research when it comes to PPC, but pretty average for SEO purposes. Both tools also have a backlink database, which can be helpful for determining competition and finding outreach targets. However, they both aren’t great. Ahrefs – 17k backlinks from 620 referring domains. Ahrefs is the gold standard of SEO tools, so it’s not reasonable to expect SpyFu or SEMrush to be as good for this. However, SpyFu’s link database is very weak. SEMrush’s link database isn’t perfect, but it’s certainly a league better. I repeated this basic test for several links and they all had the same results. 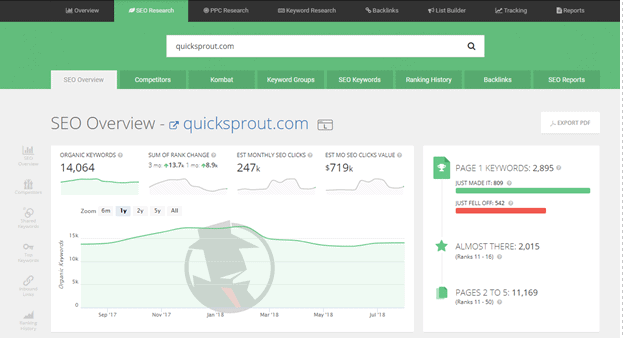 Here’s what backlink analysis looks like in both tools. There’s a separate menu option for backlinks in SpyFu. Alternatively, you can type in a keyword, and you’ll get a list of backlinks that point to the pages that rank best for that keyword. But keep in mind that this is far from a comprehensive list, as I just went over above. The organic clicks can quickly tell you if the page is popular enough to target for referral traffic alone. That’s really it in terms of backlink analysis in SpyFu. Backlinks are included as a section in “domain analytics” in SEMrush. The total number of backlinks over time. This page also has multiple additional tabs for more detail. Most of your time will be spent in the “backlinks” or “referring domains” tabs. The layout is great, and very similar to Ahrefs. While the link database isn’t perfect, it’s still pretty good. SEMrush is clearly better than SpyFu for anything concerning backlinks. 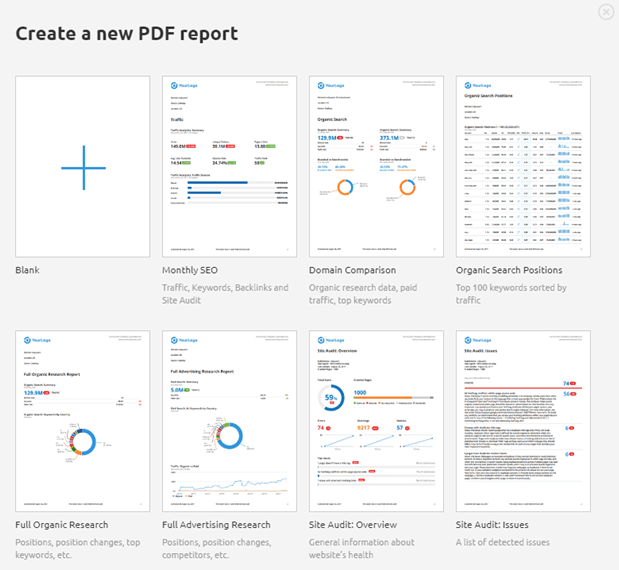 Both tools allow you to summarize a bunch of the data we’ve looked at into PDF reports. SpyFu has a few set reports that you can make. 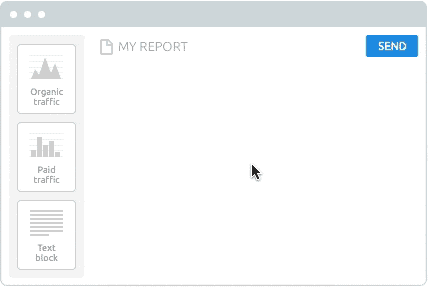 It’s very thorough and not bad for a quick automated report, although little customization is available. While SpyFu’s reports are fine if all you’ll need are basic reports occasionally, SEMrush’s customization and templates are much better. 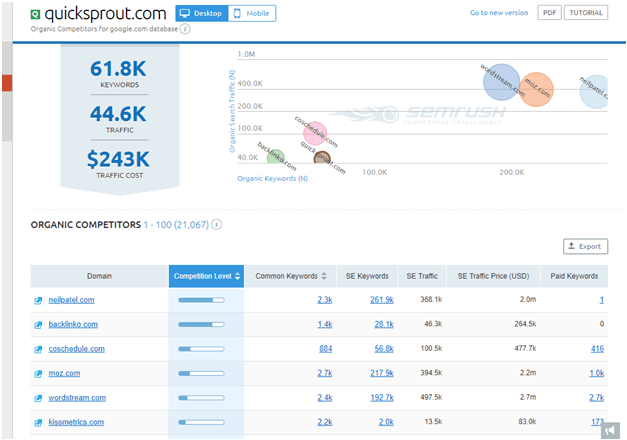 We’ve looked at all the cored features, but SEMrush offers a few features that SpyFu doesn’t. These won’t be useful for everyone, but may. All of these have been added over time because SEMrush aims to be an all-in-one tool for marketing teams so that you don’t need to buy another tool just for something like monitoring brand mentions. It covers all the basic technical checks that most SEOs do when starting work on a new site, and can be handy. With tools this complex, you’ll likely need some guidance at some point, whether from a person or help document. SpyFu only offers support between 7am-8pm, Monday through Friday. Live chat and phone support are available. 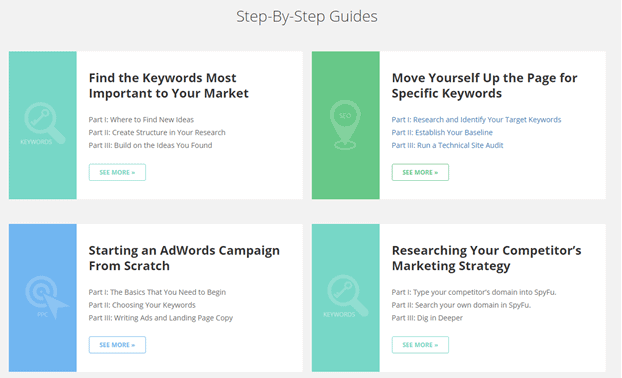 The help articles are reasonably well written, but the guides to marketing are relatively basic if you’re interested in this tool to begin with. 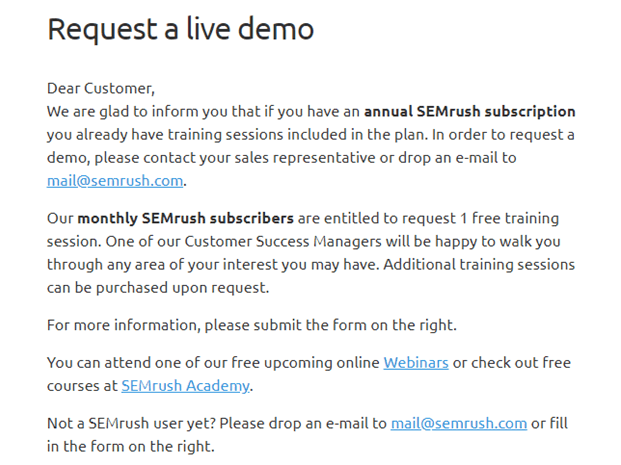 SEMrush only offers support through phone and email. Support reps via phone are only available during business hours, however they have both North American and European reps. The articles are very well written (example), with great detail and helpful images. Overall their support availability and knowledge base quality are similar, although SEMrush’s articles are slightly better written. 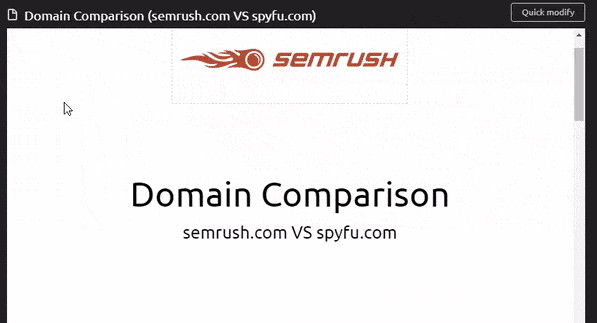 SpyFu vs SEMrush: Which is Better? Both tools are very good compared to others that focus on competitor research for SEO and PPC. No matter which one you pick, it will be useful. Keep in mind that we only looked at some features (although the most important) because they both offer a ton of functionality. Let me summarize my main thoughts on each aspect for you. Pricing SpyFu SpyFu is cheaper in general, and offers the cheapest introductory plan. However, you give up some features to save that money. Ease of use No winner Both have minimal onboarding processes, but very intuitive layouts that are easy to use for new users. 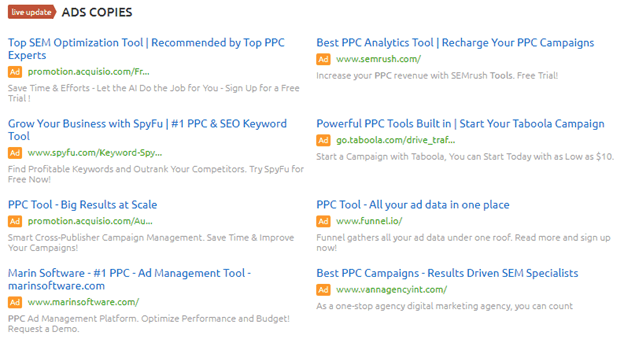 Advertising research SEMrush (slight edge) Both tools have great advertising data, but SEMrush also allows you to see the keyword groups targeted by each ad. Backlink analysis SEMrush SpyFu’s backlink database is very small and incomplete. SEMrush’s isn’t perfect, but is substantially better. 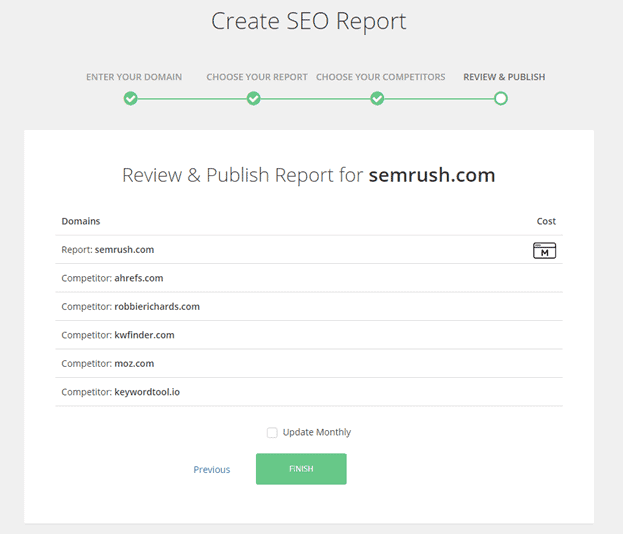 Reporting SEMrush SpyFu has good basic reports, but SEMrush offers more templates and the option to completely customize what data is included (and the order). 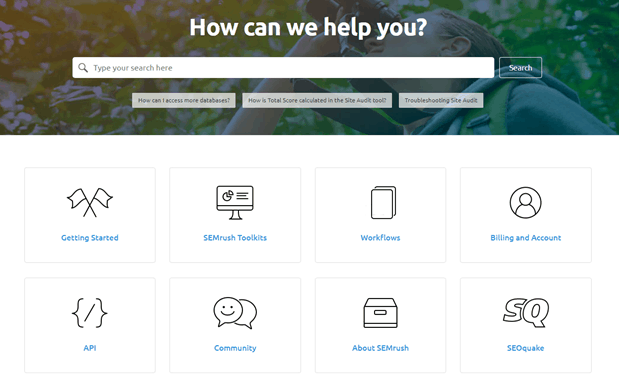 Extra project features SEMrush SEMrush offers everything SpyFu does, and more. 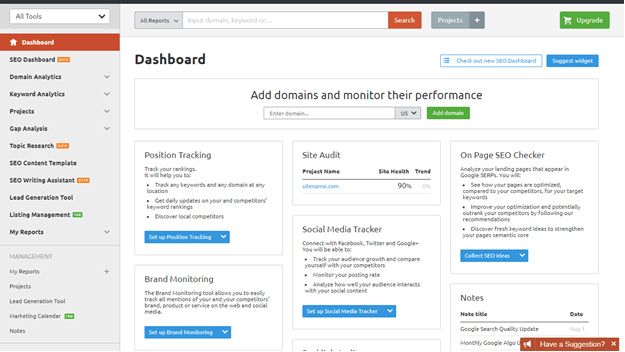 They offer great site and backlink audits, plus other tools like brand mention monitoring and social media posting. Customer support No winner Both offer similar support hours for phone, and both have solid knowledge bases with hundreds of articles. So if I had to pick a winner, SEMrush is clearly the better tool when it comes to quality and feature set. 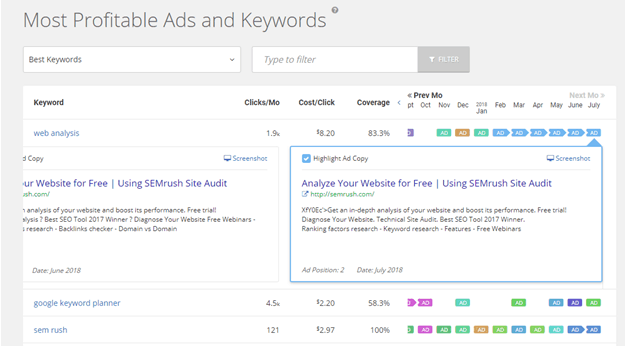 That being said, SpyFu is not a bad tool by any means, and can be a great budget option if you’re only looking for the core features like SEO and advertising research. However, if you can afford it, I highly recommend giving SEMrush a shot.